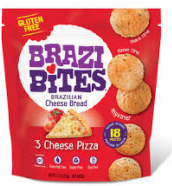 Right now, you can fill out a short form to send a friend a FREE Brazilian Cheese Bread Brazi Bites Product Coupon! This is a $4.87 value! Your friend will get an e-mail with a link to request their free coupon (or you can just send it to yourself). They have a store locator to see where their products are sold.